Venezuela is in an economic free fall. As a result of government-led mismanagement and corruption, the currency value is plummeting, prices are hyperinflated, and gross domestic product (GDP) has fallen by over a third in the last five years. In an economy that produces little except oil, the government has cut imports by over 75 percent, choosing to use its hard currency to service the roughly $140 billion in debt and other obligations. These economic choices have led to a humanitarian crisis. Basic food and medicines for Venezuela’s approximately thirty million citizens are increasingly scarce, and the devastation of the health-care system has spurred outbreaks of treatable diseases and rising death rates. President Nicolas Maduro is pushing the nation toward authoritarianism, shutting down the free press, marginalizing the opposition-led legislature, barring opposition parties from participating in elections, and imprisoning political opponents, and in the summer of 2017 broke the democratic constitutional order with the illegitimate election of a constituent assembly. The economic and humanitarian crises, combined with rising political persecution, have forced many Venezuelans to flee; around five hundred thousand have left the country in the last two years alone. 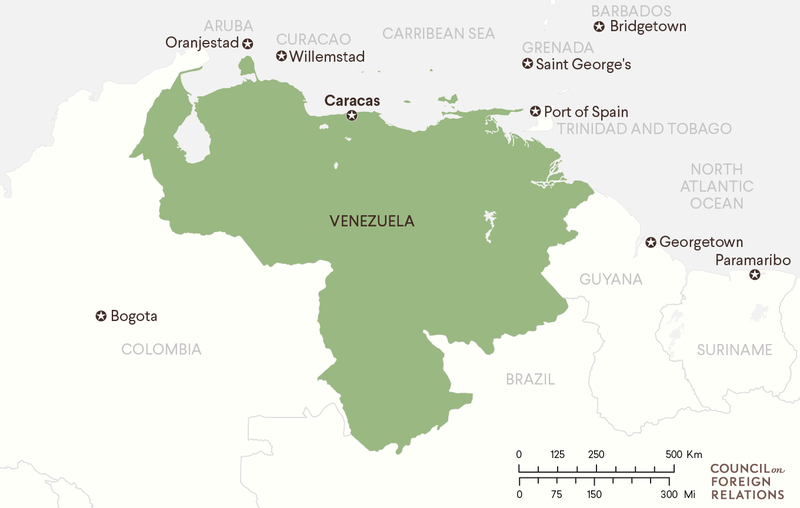 If conditions worsen, many more Venezuelans could flow into neighboring countries. Colombia would be burdened the most by these outflows, given the length of the shared border, the commercial links, and the personal ties millions of Venezuelans have there. Brazil, Guyana, and nearby Caribbean islands would also see an uptick in refugees that could overwhelm clinics and schools and potentially destabilize local economies and polities. The United States should consider not only the potential damage and disruption caused to Venezuela’s neighbors by a refugee crisis but also the implications of the crisis for U.S. interests. The economic, national security, and health costs imposed on the United States by a potential disruption in Venezuelan oil production, an increase in drug trafficking, or an epidemic, respectively, would be substantial. The United States can do little to prevent Venezuela’s further downward spiral. However, it can and should take measures to mitigate the political, economic, and humanitarian consequences of a potential mass emigration. Beginning with former President Hugo Chavez’s ascent to power in 1999, an estimated two million Venezuelans have left their country. The outflow has escalated in recent months, with the majority of people crossing over to Colombia and Brazil; thousands of others have fled to nearby islands. 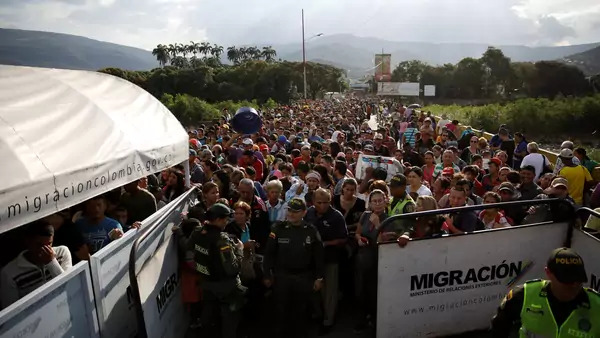 According to the UN High Commissioner for Refugees (UNHCR), in 2016 twenty-seven thousand Venezuelans sought asylum worldwide; from January through July 2017 alone, more than fifty-two thousand applied for asylum. Over fifteen thousand of these have filed in the United States, making Venezuelans the most numerous asylum seekers in the country. Many times this number are departing Venezuela on other visa classifications and via informal routes. The UNHCR conservatively estimates that five thousand Venezuelans now reside in Curacao, twenty thousand in Aruba, thirty thousand in Brazil, forty thousand in Trinidad and Tobago, and over six hundred thousand in Colombia (see map). These flows will likely continue, as Maduro’s government remains unwilling to change economic direction. The possibility of these human outflows accelerating into mass emigration is also significant. Even if 5 percent of the current population fled (a smaller percentage than recent outflows from Syria or Yemen), that would mean well over one million migrants. And if the composition of the Venezuelan flows were similar to that of other refugee crises, half of those fleeing would be children. Three circumstances could trigger this acceleration in outflows: a sharp deterioration in food supply, an epidemic, or an explosion of violence. Any of these three would further increase the likelihood of a refugee crisis. An overwhelming majority of Venezuelans already lack easy access to food and daily necessities. Surveys report that nearly nine in ten Venezuelans have difficulty purchasing food; relatedly, three out of four Venezuelans have lost weight, an average of nineteen pounds just in 2017. Years of intervention, nationalization, and expropriation have decimated local agriculture. The vast majority of food now comes from abroad, and distribution is firmly in the hands of the Maduro-aligned military. In addition to providing the food sold in price-controlled supermarkets and restaurants, the military directly distributes basic products to nearly six million families, roughly 70 percent of the population, through local provision and production committees (CLAPs). According to news reports, a good amount of this official food supply is sold on the black market. This control gives military officers—and their families—access to food as well as significant power and enrichment opportunities. Already there have been reports of uneven access to the military-distributed food packages through CLAPs. If the prevalence of food diminishes, whether at government-controlled prices or on the black market, desperate Venezuelans would flee in larger numbers. The government increasingly needs to choose between using its hard currency to pay external debt obligations and feeding its population. In 2017, it chose to reduce food and other essential imports by nearly 30 percent in order to meet debt payments of $10 billion. The government owes another $10 billion in 2018 and $14 billion in 2019. U.S. financial sanctions have made it virtually impossible to roll over or raise new money in international markets, and Russian and Chinese loans have not covered the shortfalls. If the government chooses to continue servicing its obligations, food insecurity could worsen to an extent that drives mass emigration. Inflationary pressures could also cause a collapse in the food supply. With the International Monetary Fund (IMF) predicting inflation rates of over 2,000 percent in 2018, provisions on the black market could become out of reach for the average Venezuelan. The consequences of a debt default are not wholly certain, but a default could further limit access to food. On the surface, a default would free public money for food and medicine by lowering or ending external debt servicing. Additionally, the ensuing economic chaos could lead to regime change and new economic policies that could alleviate the current hardships and migration pressures. However, if the current government remained in power, so too would U.S. financial sanctions. That would make an IMF stabilization package and a broader debt restructuring impossible in the event of a default, further limiting access to hard currency and imports. The ensuing economic dislocations could disrupt food distribution to segments of the population. Given the politicization of access to food, rising political opposition—combined with increasing restrictions on financial resources for any of the reasons above—could push the government to intentionally starve opposition-controlled areas, forcing many to leave. Access to basic health care has declined precipitously in Venezuela. One-fifth of the country’s medical personnel have fled the country in the past four years alone. Understaffed hospitals are also underequipped: over half lack enough beds for patients, three out of four are missing the basic drugs on the World Health Organization (WHO) list of essential medicines, and two out of five are without drinkable water. The health-care system is incapable of dealing with rising child malnutrition, which now exceeds the WHO’s crisis threshold, according to Caritas, a Catholic charity. A 2015 Ministry of Health report reveals that over 2 percent of all newborns die in their first four weeks, up from 0.02 percent three years ago. The maternal mortality rate has increased nearly fivefold in the same period. With the collapse of basic health infrastructure, treatable and communicable diseases have spread. Diabetes and hypertension have doubled in the last year. Deaths from HIV/AIDS are ascending rapidly in Venezuela—once a model for HIV/AIDS management—even as they decline regionally, as more than one hundred thousand Venezuelans living with HIV/AIDS have no access to medication. Several outbreaks of tuberculosis, diphtheria, and Chagas disease have been reported among an increasingly malnourished population. A former health minister estimates that over half a million Venezuelans have contracted malaria. Vaccines have largely disappeared, leaving at least one million children vulnerable to measles. An epidemic of one of these or other deadlier diseases could cause a mass emigration, particularly from urban centers. Refugees would likely carry the illness to neighboring countries and strain the already overcrowded border hospitals. Venezuelans face persistent insecurity in their daily lives. Homicides in Caracas top 140 per 100,000 people, far outpacing rates in Baghdad and Kabul. Almost 40 percent of Venezuelans report having been robbed in the last year. A newer phenomenon of politically oriented violence has been on the rise. During street protests in 2017, more than 150 Venezuelans were killed by government forces, mainly the National Guard. If politically motivated violence escalates, it could lead to mass emigration. Such violence could be spurred by divisions within the opposition or the regime. In response to the authoritarian moves of the Maduro government, the political opposition has worked to find democratic avenues for change. These have included contesting and winning a two-thirds majority in the legislature in 2015 (only to have the Maduro-controlled Supreme Court annul nearly all of its legislation), pushing for a constitutionally allowed presidential-recall referendum (stymied again by the politicized court system), protesting the illegitimate constituent assembly election process, and more recently participating in—and losing—manipulated regional elections. With few legal avenues now available, the political opposition has fragmented, opening space for more radical elements within to turn to more violent tactics and potentially to arms. If this occurs, the government would likely respond swiftly and harshly, leading to hundreds if not thousands of deaths and potentially forcing opposition members and sympathizers to flee. Discord is also reported among the United Socialist Party of Venezuela (PSUV) members and supporters, some of whom allege that Maduro has betrayed Chavez’s ideals in word and deed by overturning his 1999 constitution. Several high- and middle-ranking military officers have also been arrested, allegedly for plotting coups. Further schisms, particularly among or within the four main security forces—the military, the National Guard, government-controlled militias, and neighborhood vigilante groups called colectivos—could lead to an explosion of civil unrest and even fighting in the streets. It could also lead to generalized disorder and more impunity. Any of these scenarios could cause citizens to flee. A majority of refugees would likely flee to Colombia given geographic, commercial, and familial ties. Every day, about twenty-five thousand Venezuelans cross the 1,378-mile-long border to buy basic goods—adding up to over nine million visits a year. As the situation worsens, some of them could decide to stay in Colombia. In addition, over five million people of Colombian origin live in Venezuela, many of whom had been displaced in the 1980s and 1990s by the violence caused by the Revolutionary Armed Forces of Colombia (FARC) and the paramilitary. If these Venezuelans chose to leave en masse, Colombia would be hard-pressed not to take them back. A majority of refugees would likely flee to Colombia given geographic, commercial, and familial ties. Brazil too would be a major destination; desperate Venezuelans already account for the majority of hospital visits along the border. Tens—if not hundreds—of thousands could trek south on the sparse road system through the Amazon. Such a movement of people would undoubtedly strain the public resources of border states Roraima and Amazonas in Brazil, which has dealt with similarly sized refugee flows before, including from Haiti. Additional possible destinations include Guyana and the nearby Caribbean islands of Antigua and Barbuda, Aruba, Curacao, and Trinidad and Tobago, which can absorb far fewer refugees. An influx of several thousand people could overwhelm local health, education, and basic shelter in nations already battered by hurricanes. Deteriorating economic and health measures and increased political persecution and violence could accelerate refugee flows. Further steep declines in GDP, oil revenues, or foreign currency reserves along with sharp increases in inflation and unemployment would signal toughening circumstances for individuals and families. As the combination of hyperinflation and the government’s inability to print enough new bills undermines the use of currency, scarcity and hardship would intensify. In terms of health, rapidly rising maternal mortality rates have already led to mass flows of pregnant women to hospitals across the borders. Reports of new disease outbreaks or fast-rising death tolls would suggest a spreading epidemic that could begin to drive greater population movements. Street protests and government repression escalated from April to July 2017, leaving over 150 people dead, 2,000 injured, and 5,400 incarcerated. Since then, demonstrations have faded. Another uptick met with a heavy-handed response could spur the movement of people. So too could exhortations by Maduro for vigilante justice against his opponents or explicit exclusion of opposition sympathizers from accessing publicly provided food and basic services. Other political warning indicators include an increase in politically motivated violence or assassinations and the formation of armed groups. Another set of warning indicators would include countries becoming more open to receiving Venezuelans so that the costs of leaving are lowered. Recent steps include Colombia granting temporary legal status to more than 150,000 Venezuelans who overstayed visas, Peru introducing a special visa to allow Venezuelans already in the country to study and work for a year, and Argentina making it easier for Venezuelans to obtain a work permit. Massive human outflows from Venezuela could destabilize the politics, economics, and security of neighboring nations and thus significantly harm U.S. national security interests. These challenges come at a particularly delicate time for Colombia, as the longtime U.S. ally works to implement a historic peace process with former FARC guerrillas. An influx of refugees into formerly FARC-controlled border communities could undermine stabilization efforts by imposing an added economic and humanitarian burden on local authorities. Also threatened are the small Caribbean islands, where even a few thousand migrants could overwhelm local services and increase social tensions. Many of these countries lack legal frameworks and departments to process asylum seekers and migrants, further complicating matters. A refugee crisis could hinder U.S. efforts to defeat transnational drug and criminal organizations. Venezuela has become a major transit country for Colombian cocaine headed to the United States and Europe, with reported involvement of high-ranking officials in drug trafficking and organized crime. (President Donald J. Trump has publicly criticized Colombia’s failure to crack down on coca production, which surged to a decade high in 2017; about 90 percent of cocaine in the United States comes from Colombia.) A refugee wave could aggravate these challenges, as criminal organizations could abuse a large and vulnerable population for recruitment or as prey for human trafficking. In the event of an epidemic, mass migration would be accompanied by a health crisis across the Americas, including in the United States. Turmoil within Venezuela could also disrupt the daily flow of the seven hundred thousand barrels of Venezuelan oil to U.S. refineries—roughly 8 percent of all oil imports—hampering individual businesses in Louisiana, Mississippi, and Texas and likely raising retail gas rates by twenty to thirty cents a gallon. Turmoil within Venezuela could disrupt the daily flow of the 700,000 barrels of Venezuelan oil to U.S. refineries. President Trump has spoken consistently on the need for democracy and humanitarian assistance in Venezuela, personally met members of the Venezuelan opposition, and discussed Venezuela during his meetings with Latin American heads of state. The U.S. State Department has called on the Venezuelan government to allow international aid into the country; in UN Security Council meetings, Ambassador Nikki Haley has reaffirmed the United States’ humanitarian commitment to Venezuela. Tens of thousands of Venezuelan Americans and over two hundred thousand Colombian Americans reside in the swing state of Florida; this domestic electoral incentive drives broad congressional support for a restoration of democracy in Venezuela and the provision of humanitarian aid to the country. To prevent a refugee crisis across the Americas, the United States, other nations, and multilateral organizations could pursue policies designed to encourage Venezuelans to stay in their homes rather than flee. As these contingency scenarios result from the Maduro government’s economic mismanagement, widespread corruption, and repressive tendencies, Venezuela needs to change its economic, political, and social policies to keep its citizens home. This requires a change in government and likely a restoration of democracy. The United States, other nations, and international organizations have already tried a mix of diplomacy and sanctions to expand the governing coalition and force a transition. A 2016 initiative led by former Dominican, Panamanian, and Spanish leaders and supported by Pope Francis failed after the Venezuelan government refused to meet its initial commitments, including freeing political prisoners and setting an electoral timetable. The European Union (EU) could not generate enough pressure to restart a dialogue in September 2017. In December 2017, members of the opposition, along with civil society organizations, returned to negotiations with government representatives in the Dominican Republic, with Bolivia, Chile, Mexico, and Nicaragua acting as guarantors. No agreement has yet been reached yet. The Organization of American States (OAS) has attempted to name and shame the Venezuelan government into changing its political behavior, but it has been unable to amass the two-thirds majority necessary to suspend Venezuela from the organization. The OAS is now working to bring members of the Maduro government to the International Criminal Court for crimes against humanity, including political and human rights abuses against the opposition. A group of twelve countries—including Argentina, Brazil, Canada, and Mexico—has also formed to condemn Venezuela’s undemocratic practices. Within the United Nations, several member states and bodies, including the UN Human Rights Council, have identified human rights violations in Venezuela and called for investigations into crimes against humanity. At the Security Council, however, veto holders China and Russia have prevented concrete initiatives against the regime. Efforts made so far have failed to change the actions of the Maduro government in ways that would alleviate human suffering and stop the flow of migrants. Sanctions represent another means of pressure. The Barack Obama and Donald Trump administrations have cumulatively sanctioned over forty Venezuelan individuals for human rights abuses or support of terrorist and drug trafficking organizations by freezing their assets, restricting access to the U.S. financial system, banning them from the United States, and forbidding them from doing business with U.S. citizens. In August 2017, the Trump administration levied financial sanctions on the Venezuelan government and the state-owned oil and gas company Petroleos de Venezuela, SA (PDVSA), limiting their access to U.S. financial markets and their ability to remit or even service outstanding debt obligations. Canada and the EU have also sanctioned corrupt Venezuelan individuals, and the EU has banned the sale of goods to Venezuela that could be used for repression. The United States could intensify sanctions. It could expand the list of targeted individuals and ban the sale of the lighter U.S. crude oil and diluents that Venezuela needs to pump its heavy crude and process it for export. This would temporarily disrupt production, as the Maduro government looks for other sources. The United States could also refuse to pay PDVSA directly for oil shipped to U.S. refineries and instead set up an account that would only allow the purchase of food and medicines, along the lines of the United Nations’ oil-for-food program in Iraq but this time with more stringent oversight. On the financial side, the United States could impose secondary sanctions on foreign entities that conduct business with Venezuela; these secondary sanctions would be similar to those levied on European banks that evaded sanctions on Iran or those that the United States threatened to impose on Chinese institutions handling North Korean-linked funds. Lastly, the United States could impose a full embargo on Venezuela’s oil and petroleum products or on its economy as a whole, much like the Cuban embargo. These actions could cause further hardship for Venezuelans if the regime does not fall quickly (which has been the experience with other sanctioned regimes), resulting in more refugees. Moreover, polls show that sanctions are unpopular even among Venezuelans who support the opposition; therefore, outside economic pressure risks increasing overall sympathy for the regime rather than weakening its political hold. A major impediment to the success of these diplomatic and economic policy options is the criminal history of many Venezuelan government officials. The top echelon includes individuals already sanctioned by the United States for human rights abuses, corruption, and undemocratic practices. Sealed indictments allegedly detail Venezuelan officials’ roles in drug trafficking and extensive corruption. For these officials, a democratic transition would likely mean incarceration; this possibility hardens their resolve to remain in power. Military action, which the Trump administration has floated as a possibility, is inappropriate for this situation. Military action, which the Trump administration has floated as a possibility, is inappropriate for this situation. The concrete objectives for such action remain vague, and significant resources would be necessary to occupy the nation for what could be an extended period of time. While a military option could begin with air and other limited strikes, the significant possibility of a government collapse and ensuing civil war would require preparation for a full-blown invasion and occupation. Venezuela is double the size of Iraq; to secure it, the U.S. military would need to plan for the presence of 150,000 or more troops. Much as in Iraq, these forces would likely need to remain not only to oversee new elections but also to enable a democratically elected government to regain control of portions of the country, to maintain stability, and potentially to rebuild physical and other infrastructure. A Venezuelan presence would draw attention and resources away from other security threats around the globe. Polls show a majority of Venezuelans, and a plurality of opposition supporters, are against current U.S. financial sanctions. A military intervention would be even less popular. U.S. troops would be greeted, at least by a significant segment of the population, as oppressors. The United States would also face staunch opposition from other Latin American nations, which roundly condemned President Trump’s suggestion of a military option last year. While a number of Latin American nations might be convinced to join the United States, Canada, and the European Union in sanctioning individual Venezuelan leaders for human rights, corruption, and other abuses (they have yet to do so), any military involvement or action by Venezuela’s neighbors, whether with the United States or on their own, would run counter to over one hundred years of Latin America’s nonintervention foreign policy consensus as well as go against the wishes of their voting publics. Latin American nations have been able and willing to send troops to participate in UN peacekeeping operations, including regional missions in Guatemala and Haiti. Such a mandate is unlikely in Venezuela due to China’s and Russia’s ties to the Maduro government. If the current regime ended and the United Nations authorized such an effort, Latin American nations would likely join. A change in regime would also likely bring a change in economic policy, alleviating other pressures to migrate. As it stands, the near consensus condemning the Maduro regime today would likely turn toward the United States if it intervened militarily. And the increased instability and violence resulting from an intervention could heighten a refugee crisis, leading more Venezuelans to flee. Another way to persuade people to remain in Venezuela is by making their lives there more bearable, mainly through humanitarian assistance. This step would require the consent of the Maduro regime, which despite numerous offers has not allowed aid to enter the country. It would also be difficult to keep the Venezuelan government from controlling and using the aid to bolster its power. Finally, the United States could work with neighboring countries to close their borders, making it harder for Venezuelans to flee. But this option is anti-humanitarian. It is also impractical given that hundreds of miles of border remain unguarded and that most Venezuelans currently fleeing are not going through formal application processes. Moreover, it would be politically difficult for the Colombian government to deny entry to over five million Venezuelans of Colombian origin, many of whom left Colombia in the 1980s and 1990s due to drug-related violence. Overall, the United States has few effective preventive tools or strategies to compel the change in Venezuela’s policy or government needed to alleviate the current suffering. Therefore, the United States should focus its efforts on mitigating the detrimental effects on those fleeing and on their recipient countries. The United States could help Venezuela’s neighbors mitigate a refugee crisis by creating a U.S. interagency refugee plan as the basis for a larger coordination effort. The U.S. Agency for International Development (USAID) in conjunction with the State Department’s Bureau of Population, Refugees, and Migration (PRM) and the Defense Department’s Southern Command could prepare a refugee policy—one that builds on lessons learned in Syria and South Sudan—to be implemented largely by nongovernmental and multilateral organizations working in the region. In addition to coordinating among the agencies, U.S. officials could create multilateral or multinational refugee plans, whereby the U.S. government would work with other organizations or governments to provide monetary, personnel, or supply assistance to refugees. On the ground, this assistance could contribute to expanding intake centers and building shelters, clinics, schools, warehouses, and other humanitarian infrastructure for the delivery of basic goods and services for families. Assistance could also take the form of transportation funds for Venezuelans fleeing to other, less burdened nations. The United States could push the World Bank and the Inter-American Development Bank (IADB), as the largest shareholder in both, to provide low-interest loans to middle-income countries (including Colombia and Brazil) to build infrastructure for refugees. The United States and partners, such as the EU or Japan, could guarantee these loans and fast-track the approval process. The United States could help countries that take in Venezuelans to develop asylum and refugee policies. More systematically, the United States could help countries that take in Venezuelans to develop asylum and refugee policies. The United States could encourage Guyana to sign the 1951 Refugee Convention and/or its 1967 protocol, thereby committing to accept and protect refugees. The United States could assist other Latin American nations that are already signatories (with the exception of Cuba) in developing refugee policies. It could also support refugee assistance efforts in these countries—as it has done in Lebanon for Syrian refugees—by funding food and shelter provisions, infrastructure projects, and the work of nongovernmental organizations (NGOs). Countries expecting or experiencing significant refugee inflows could work with multilateral agencies too, particularly the UNHCR, which can set up local offices to help in capacity building, support the development of an effective asylum system, and provide direct assistance to refugees and asylum seekers through and in coordination with local donors and NGOs. The United States could spearhead the development of a broader burden-sharing arrangement, coordinating efforts across the region and with other allies around the world to alleviate the crisis both for those fleeing and for people in the refugee destinations. The United States could work with the EU and other donor nations to help recipient countries build social services and support for asylum-seeking and refugee families that may not be able to return to Venezuela for years. Despite the limited chances for success, the United States should continue to pressure the Venezuelan government, preferably as part of a multinational coalition, for policy and political change. This means supporting diplomatic efforts and negotiations, despite the failure of previous efforts to bring about the desired outcomes. In addition, the United States should increase legal and financial pressures on regime wrongdoers. While sectoral or economy-wide sanctions would likely aggravate the situation, individual sanctions limit the ability of transgressors and their families to enjoy their ill-gotten gains around the world. The Department of Justice should aggressively prosecute those who have committed crimes, including drug trafficking, money laundering, international fraud, and racketeering, while the Department of the Treasury should work with other countries to replicate existing U.S. sanctions on individuals. Recognizing the difficulty in shaping events within Venezuela, the United States should concentrate on working with its allies in Venezuela’s neighborhood and the region to ease the suffering of the refugees themselves as well as to mitigate the potential political, economic, and social disturbance in receiving nations. This involves creating a broader burden-sharing arrangement for processing refugees, providing immediate humanitarian aid, and helping build the necessary infrastructure to integrate potentially over a million individuals with families into new homes and countries. The United States should weave together a domestic interagency plan and an international effort focused on countries of first asylum, supported by nations and multilateral institutions both regional and global. The United States should work with its allies in the region to ease the suffering of the refugees themselves. PRM and the Treasury Department working with the IADB and the World Bank to provide infrastructure loans to Colombia and Brazil. Following the Cuban example, the Maduro government is already encouraging migration as a way to diminish internal opposition—a trend likely to continue, if not escalate, in the months to come. These recommendations, if implemented, would serve to alleviate the pressure of a mass migration on Venezuela’s neighbors, protect those fleeing, and lessen the risk of an epidemic or armed conflict and violence spreading more broadly. By making the region more secure and politically stable, even as it faces a potential refugee crisis, these policies will protect U.S. interests.